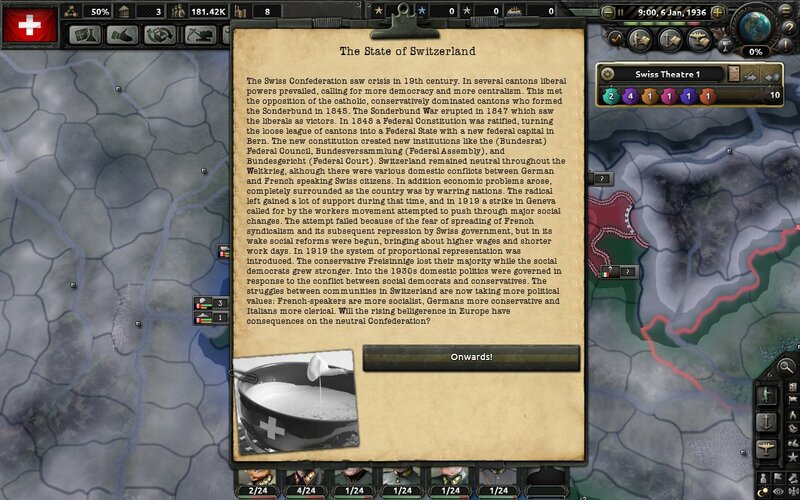 Ever since the end of the Sonderbund war the Swiss Federation has remained as a peaceful neutral power. 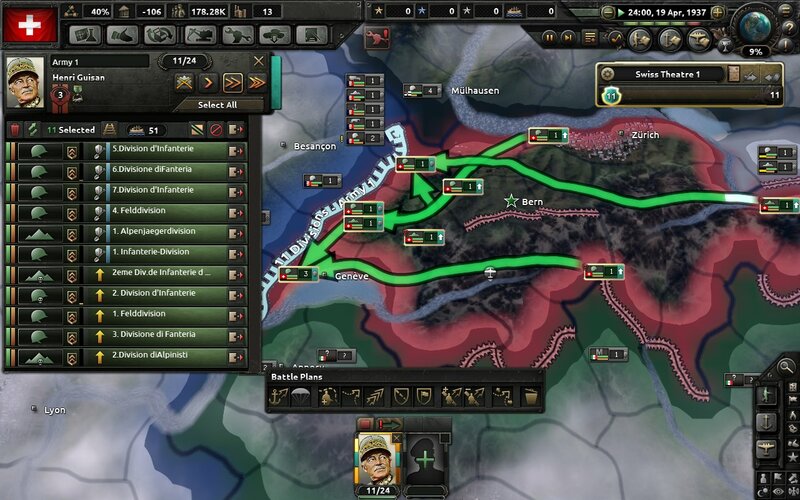 Even during the Weltkrieg in which Germany reigned victorious Switzerland stayed neutral. However by 1936 internal conflicts have taken their toll on the multiethnic nation. 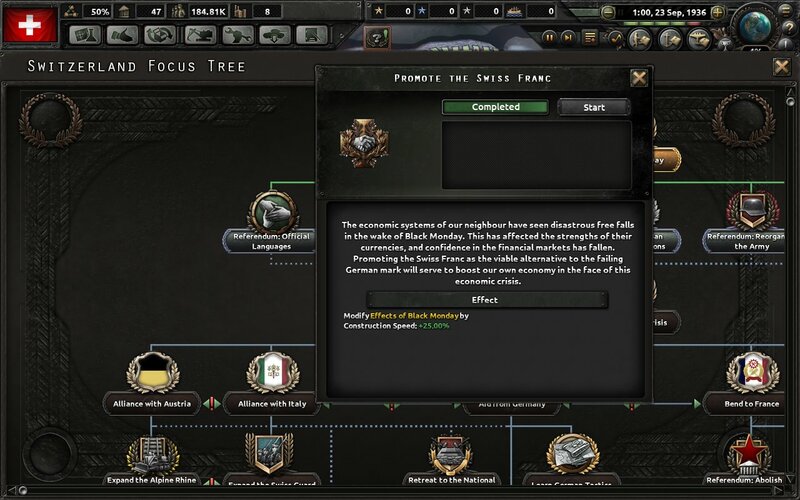 The French populations supporting the syndicalist regime in France, the Germans meanwhile being more conservative while the Italians remain clerical. The Geneva incident however remains fresh in everyones minds. Five years ago factory workers in Geneva begun a massive strike for social and economic reform. Wishing to quell said unrest before it could spread to the rest of the nation and before the Communards would intervene troops were sent in to break up the strike. Thirteen were killed with over a 100 injured in the ensuing violence. Because of this the Communists have used it as a rallying cry which has caused even more to join their trenched "Cause". 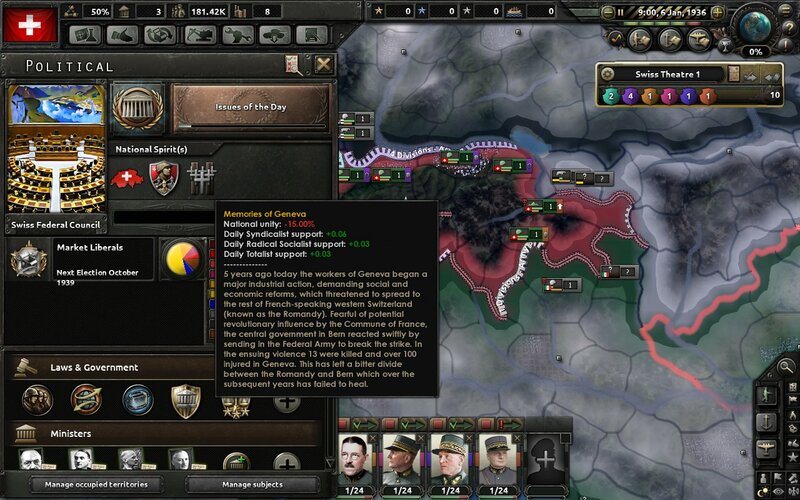 Switzerland maintains and armed neutrality with a relatively small (Compared to our neighbors at least) conscript army. 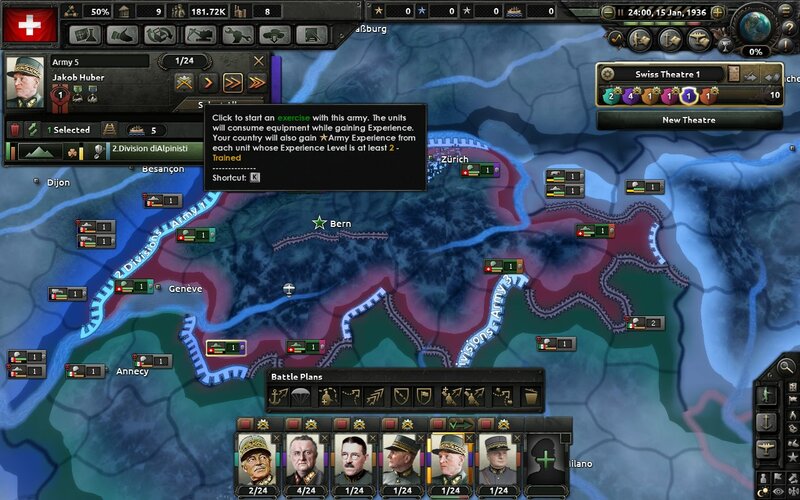 None the less Switzerland's population of four million stands ready to mobilize should the Communists or even Germans come knocking on our door. Meanwhile in Germany the Berlin Stock exchange plunges. 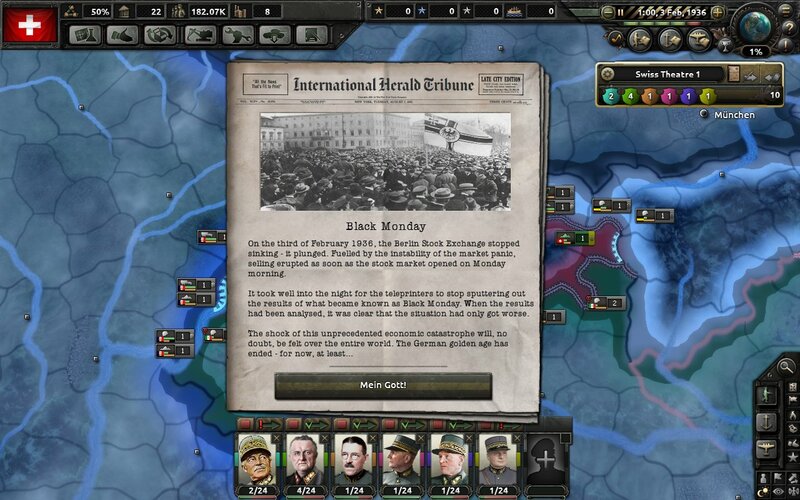 Across the world the effect is felt on markets, except in syndicalist nations like France which may now have a edge against Germany. 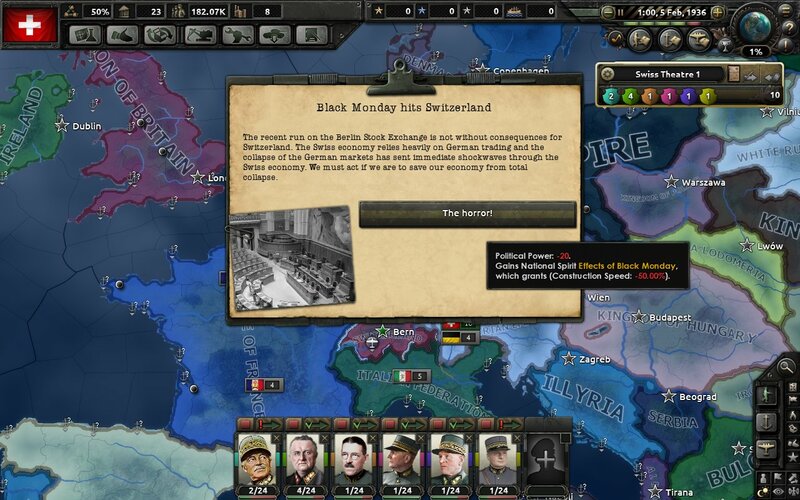 Black Monday hits hard on Switzerland as well due to our reliance on German trade and the heavy presence of German investors who now many are broke. 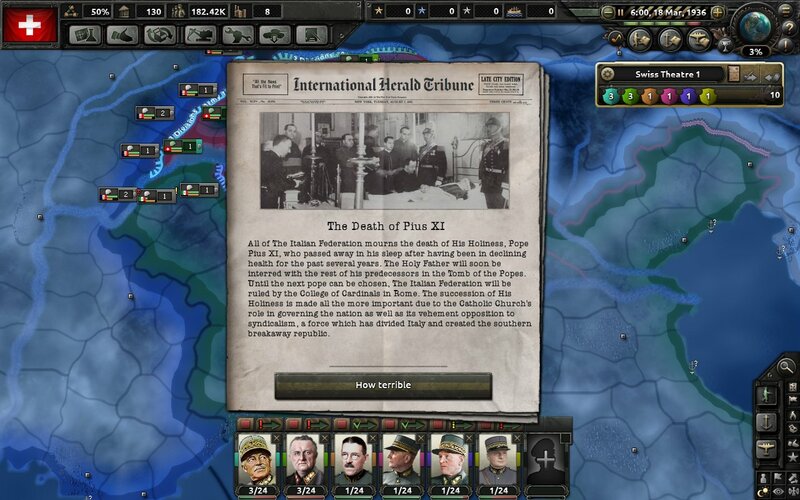 Meanwhile in Italy the pope dies. Considering the large Italian-Catholic population of Switzerland and considering we neighbor the Italians many watch closely to see who will next lead the Italian Federation. 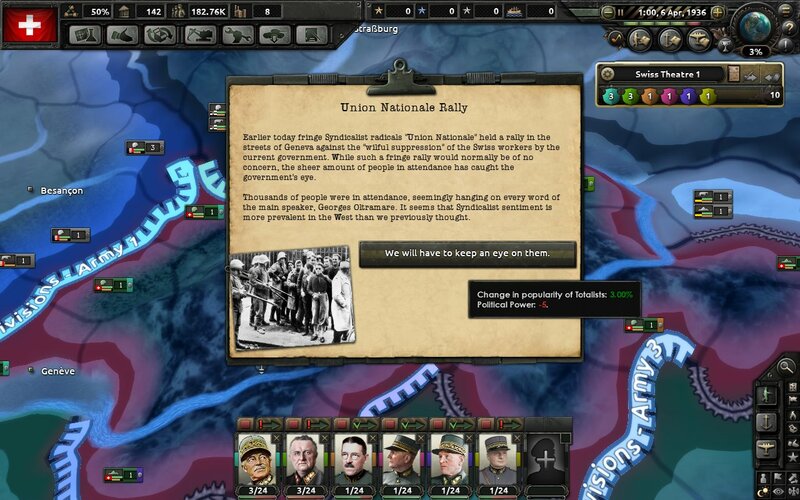 A very large rally in Geneva catches the eye of the Federal Council making many fear of further Syndicalist actions. 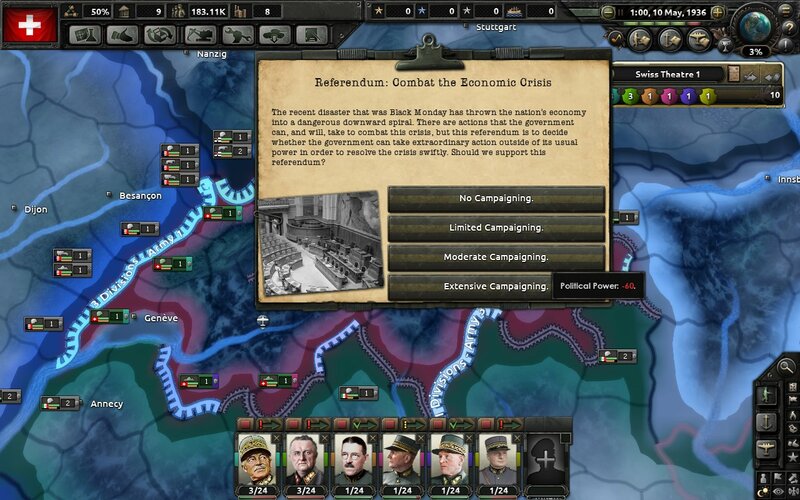 Due to the democratic nature of Switzerland most national issues are put to a vote. The issue today is a bill allowing the government to heavily intervene to reverse the effects of Black Monday. 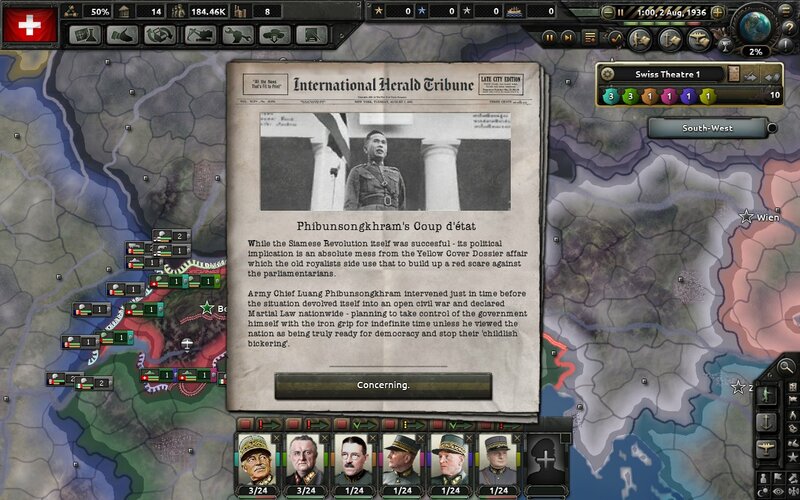 The Syndicalist devil spreads to Siam as its overtaken by revolution. The referendum passes to the joy of many in the council. 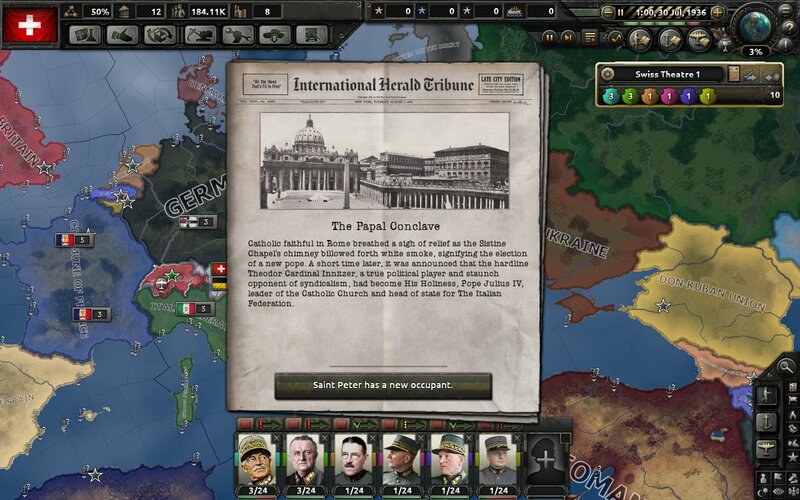 A sigh of relief is breathed after a staunch anti-syndicalist is elected as pope. 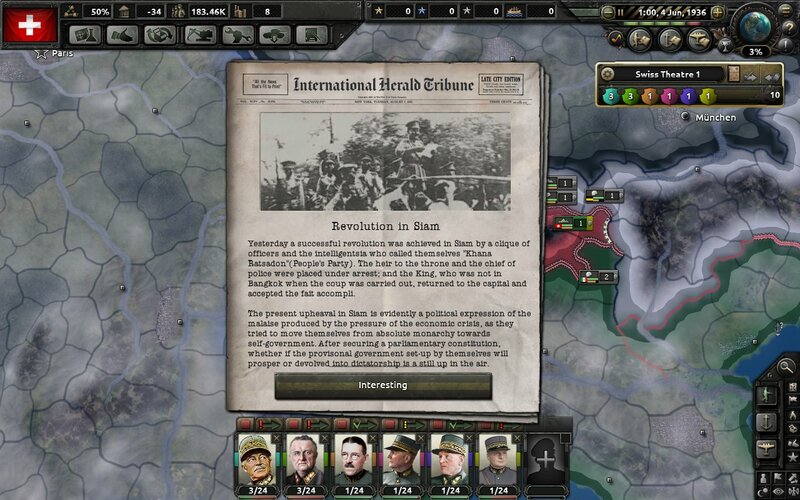 The good news continues after the revolution is put down in Siam. Seeing the collapse of the German Mark the council enacts new programs to entice large businesses to use the stable Swiss Frank. 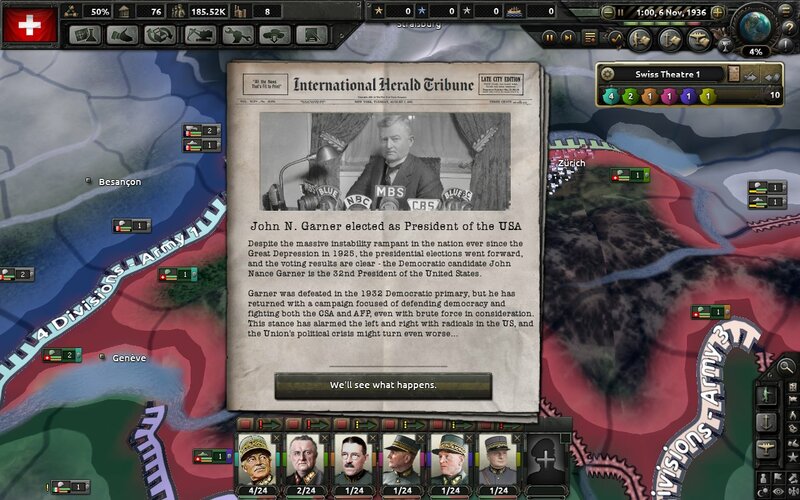 Democrat John Garner is elected president in the U.S. However if he's able to defuse the current situation in the country is yet to be seen. 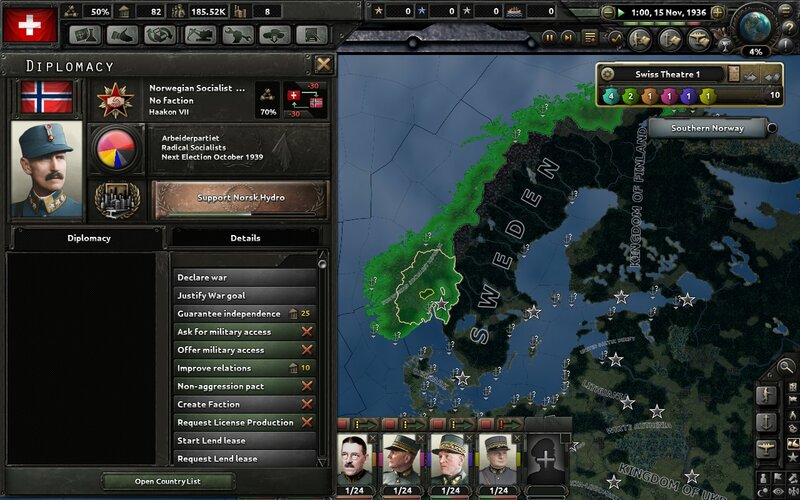 Meanwhile Norway falls to syndicalism. 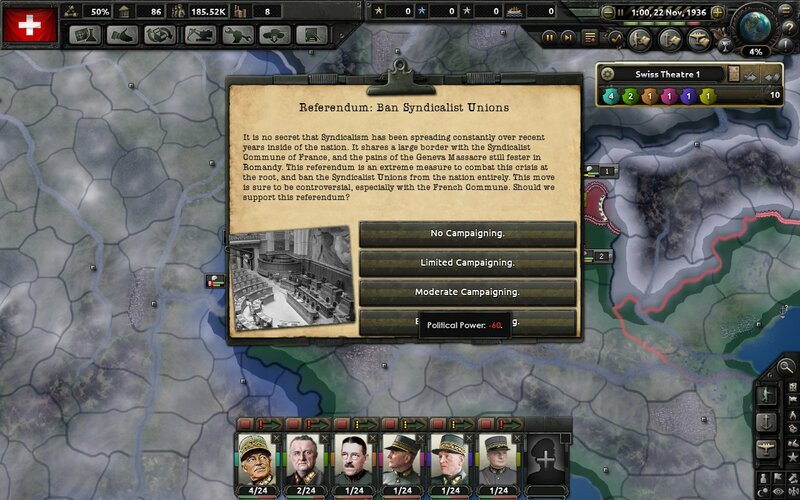 A bold referendum is put forth to ban all Syndicalist Unions in the country. Many call this move undemocratic however many argue if we don't the nation will fall to the blasted Communards. The referendum succeeds. 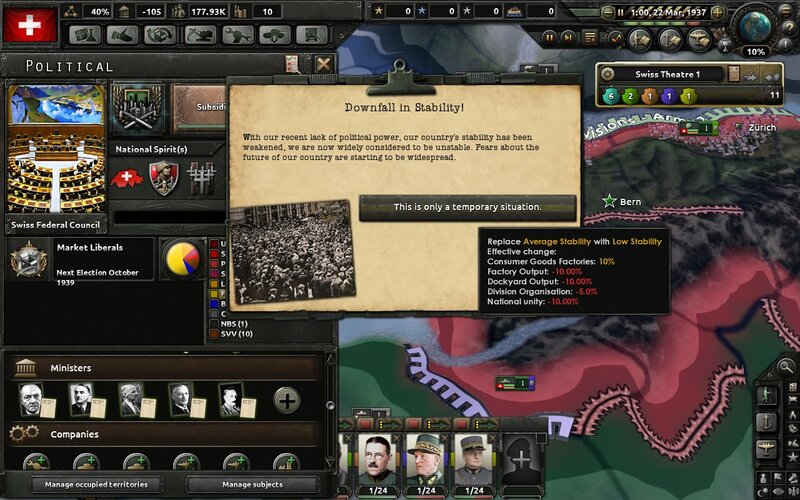 While many Syndicalists resist, both the police force and Military are called in to quell the trouble makers. The move however draws the ire of both France and Britain. 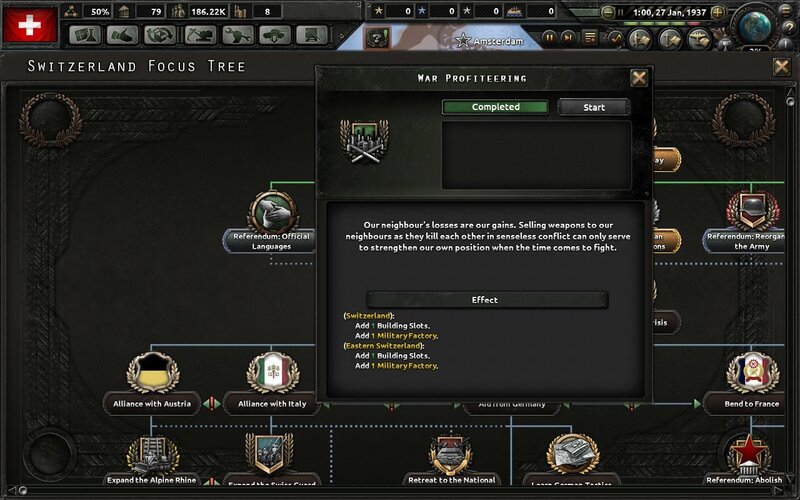 Seeing as how war is erupting all around the world the council invites several large German and American corporations to open factories in "Peaceful" Switzerland. 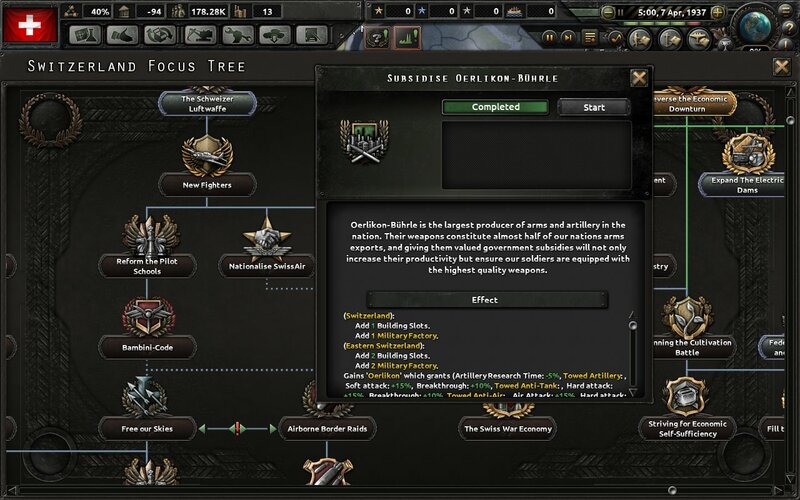 After convincing them that the Syndicalist protesters aren't much of a threat several of these corporations decide to invest in Swiss factories. 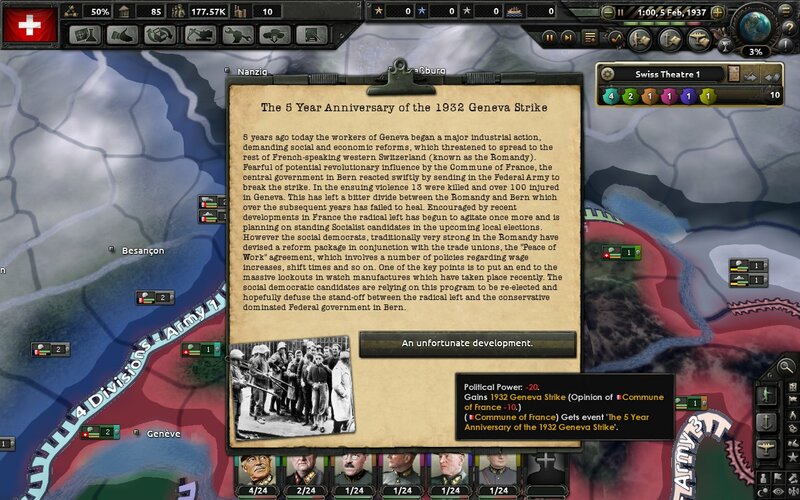 Shooken by the recent banning of Syndicalist unions the passing of the five year anniversary of the Geneva incident has agitated the far left. Many fear this will lead to them winning the 1937 cantonal elections in the french speaking regions. 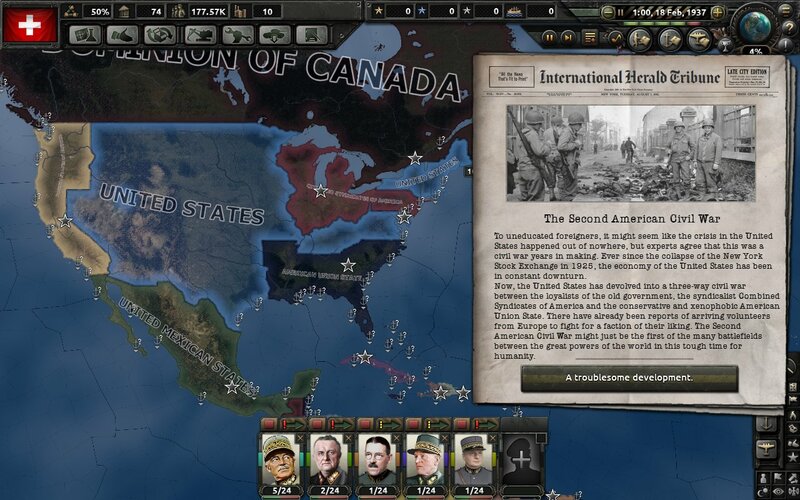 Meanwhile in America civil war breaks out. 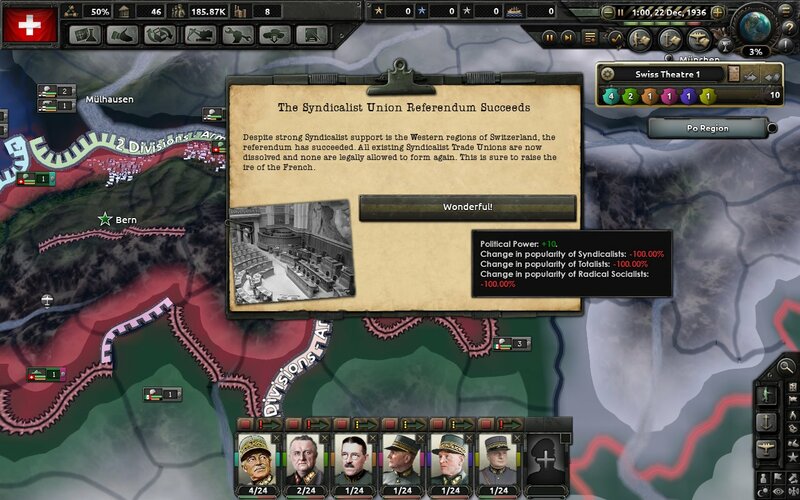 Despite the banning of Syndicalist Unions the festering anger of the French populations leads to them electing leftist parties in the 1937 Cantonal elections. 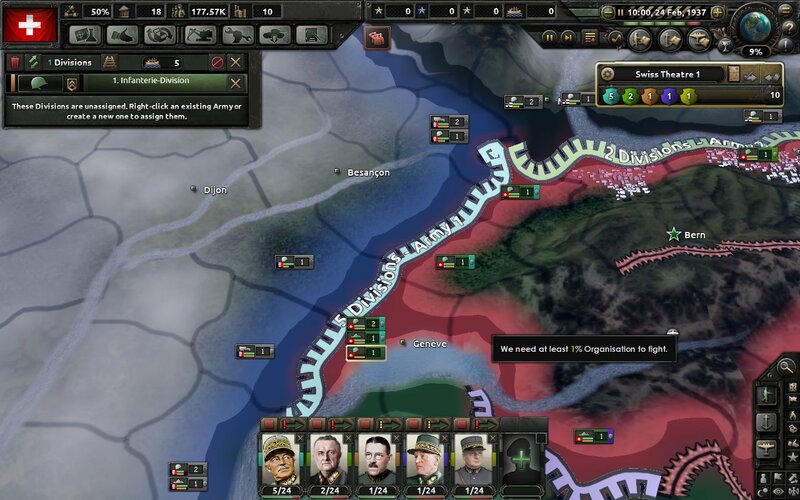 With the growing threat of French invasion new divisions are pumped out to defend the border. 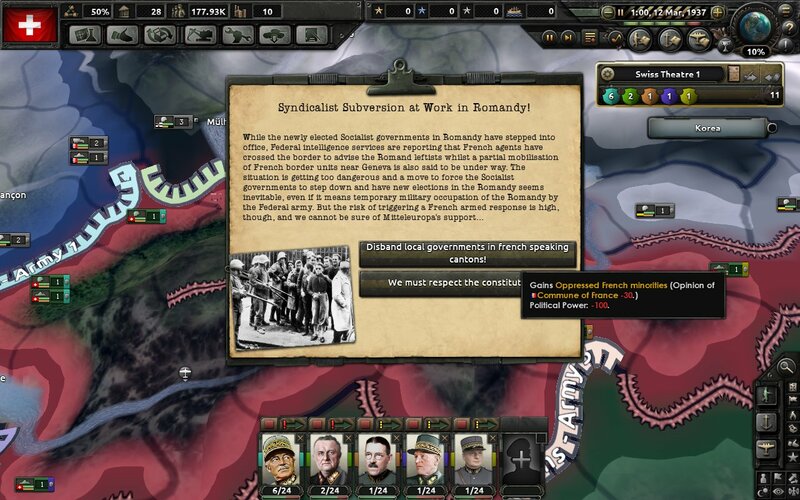 With the left wing governments taking power in Romandy its found out that the French have sent operatives to "assist" them. After news of this reaches the council they are outraged and vote to disband the local governments in those regions. The military is told to be ready to mobilize as this move is sure to incite violence. 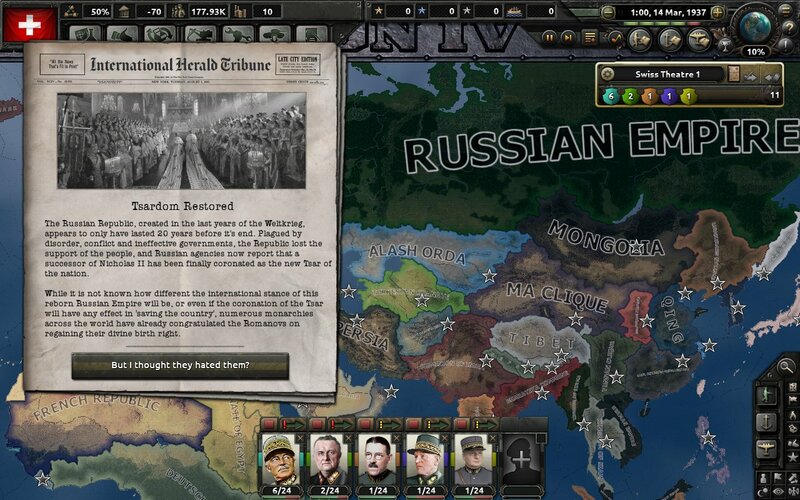 Meanwhile in Russia the republic fails and the Tsardom is restored. 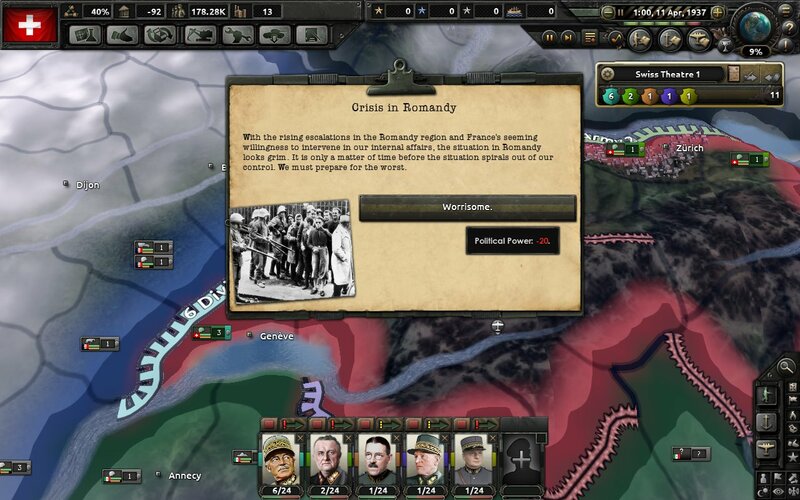 One Swiss news commentator says "At least its not the Syndicalists"
Violence erupts as the military occupation of Romandy begins. 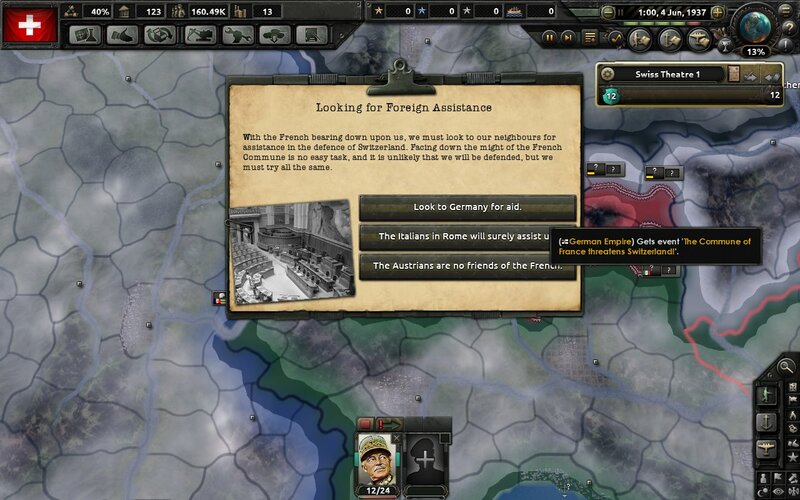 Many Syndicalist leaders are arrested, however many sneak over the boarder to France. All the while French divisions mass on the boarder. 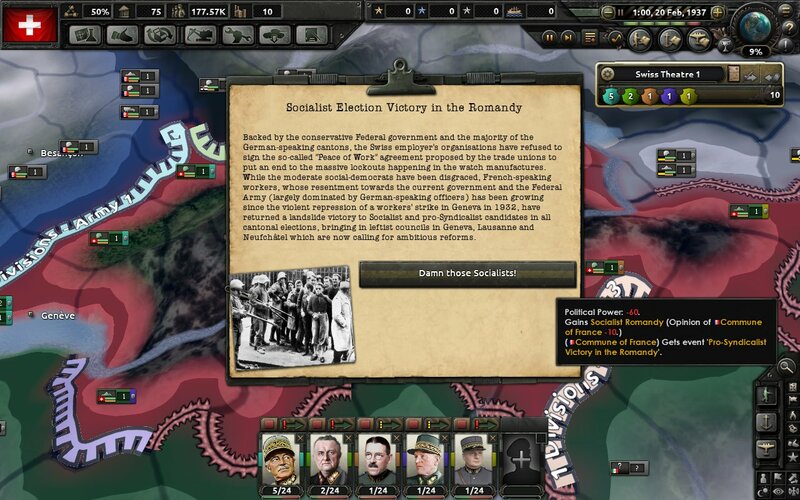 The chaos spreads as many outside of Romandy Syndicalist and not begin to doubt the councils ability to govern. In less depressing news the council votes to give subsidies to Oerlikon-Bührle which is a large Swiss weapons manufacturer. As they have struggled following Black Monday the council hopes the subsidies will revitalize the East Swiss Industrial sector. At this point war looks inevitable preparations are being made for a grand defense of the nation. 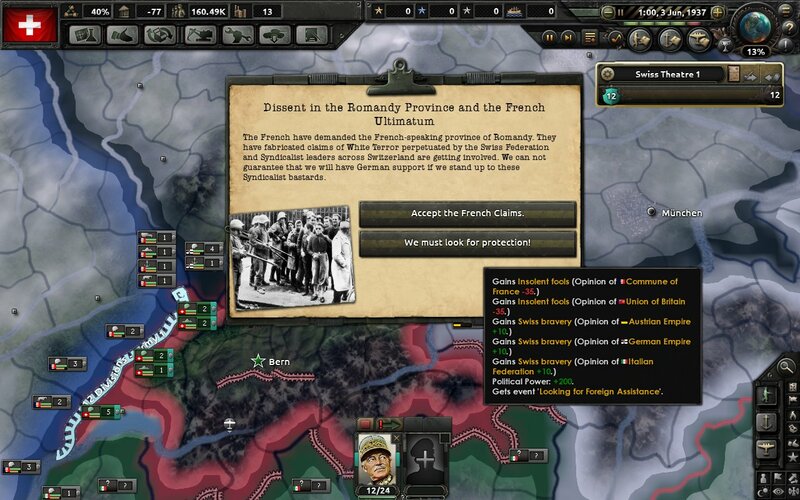 In fact all available divisions are pulled to the French Border. 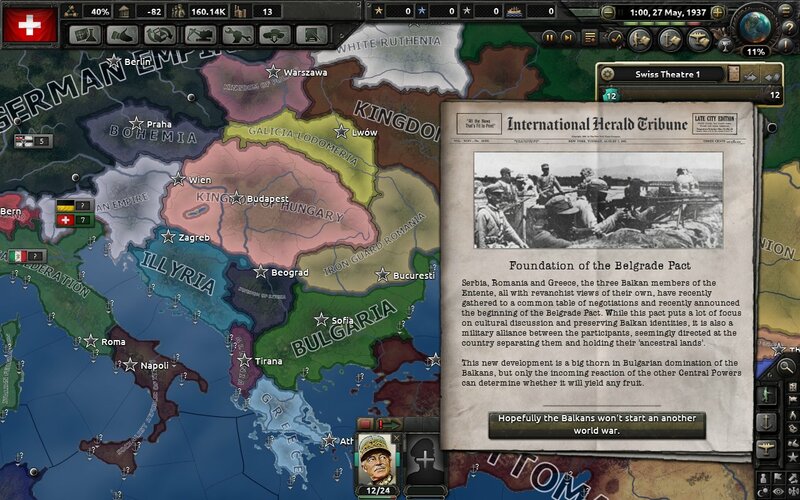 Conflict is also brewing in the Balkans as the Belgrade pact is formed to oppose Bulgaria. 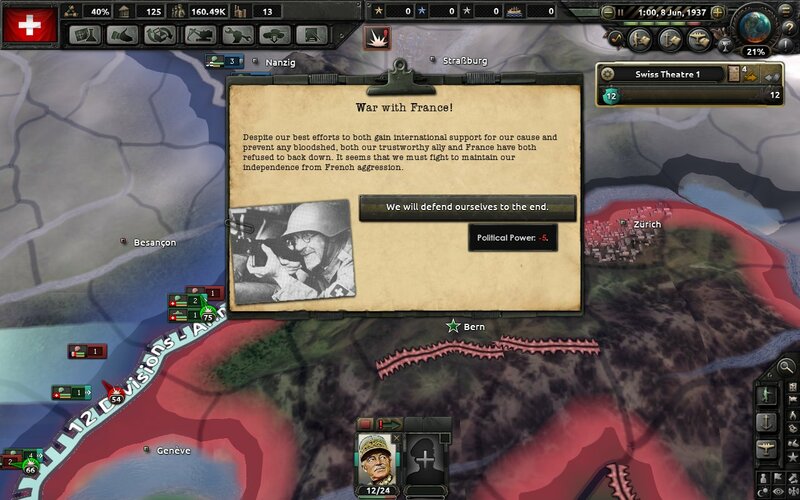 On June Third 1937 an ultimatum is sent by the French. "Cede Romandy or else". Grimly the council decides we should dig in and seek help. 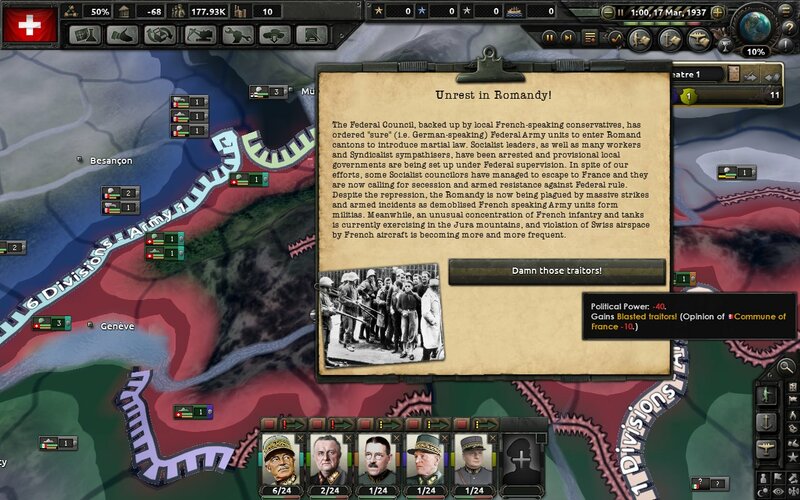 Hence an envoy is sent to Germany pleading for assitance, if they refuse we will have no other choice but to surrender. 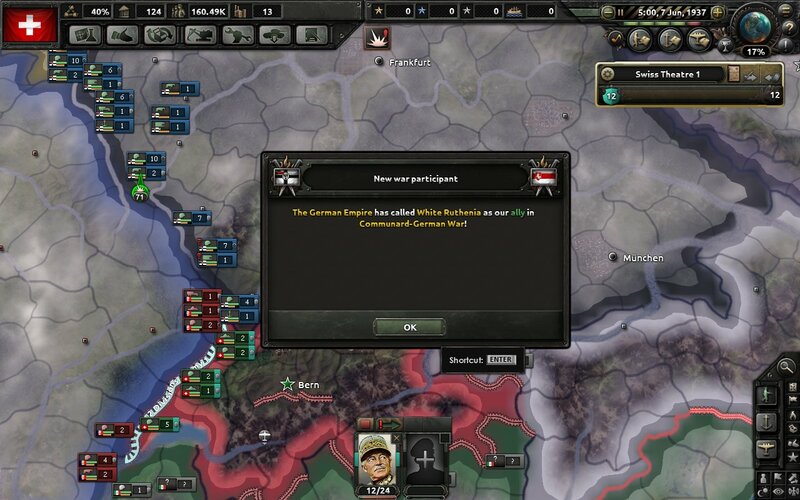 After waiting anxiously for a reply the Kaiser announces full support for Switzerland and the German military fully mobilizes. News of German assistance immediately boosts morale across the front as the first opening shoots of the war are fired. 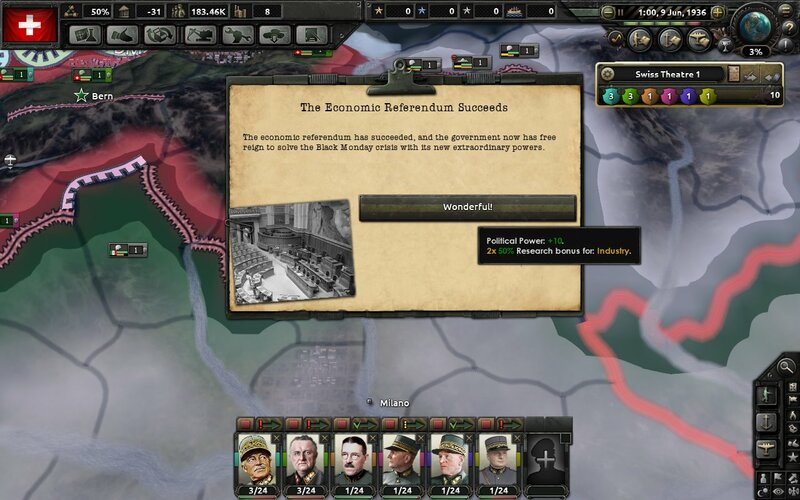 In fact even the members of the council believe together, we can win this war and wipe Syndicalism off of the face of the earth forever!